I love school reunions and the 50th jubilee of my old secondary school, Nelson's Nayland College, is being held this Easter weekend. Making it extra special is that I was commissioned to write the college's jubilee history book, which was launched on March 18. Daring to be Different - The Nayland College Way 1966-2016 tracks the school's development from its opening under the leadership of foundation principal Bill Kane through its three subsequent principals, Ras Zachariassen, Charles Newton, Rex Smith, to its current principal, Daniel Wilson. Nayland College has always prided itself on forging its own distinctly non-traditional path and working hard to provide tailored educational pathways. Researching the school's history was made that much easier with the wonderful resource that is the college's student newspaper, Circuit. This was started in 1979 and has been published continuously ever since. I was Circuit's fourth editor, back in 1982 when working on the paper was an extra-curricular activity. These days year 12 and 13 Journalism students work in class to produce a highly sophisticated product. I also had the assistance of former English teacher and now support staff member, Roger Batt, who spent many voluntary hours sorting through boxes of photos in order to find appropriate images for the book. There was no shortage of images and it was often difficult making decisions about what not to include in the decade by decade chapters. Once again, my colleague Karen Price designed the book and it is to her that we owe thanks for a fabulous looking book. 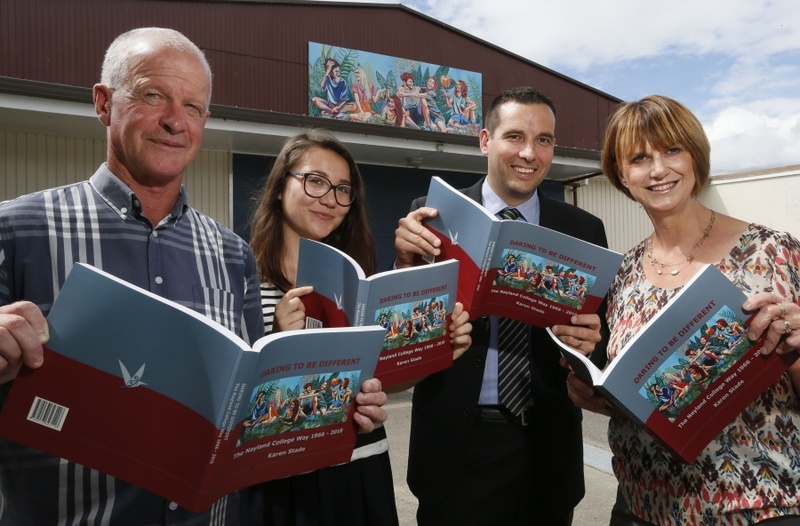 This photo, taken by Martin de Ruyter of the Nelson Mail, shows reunion committee member and deputy principal Trevor Olley, year 13 student Jasmin Kurokawa, principal Daniel Wilson, and myself, with the book whose cover features the mural which is behind us on the school gymnasium. If you are interested in getting a copy of Daring to be Different - The Nayland College Way ($45), you can buy one from the Nayland College office. Email the school at xtend@nayland.school.nz. or phone on 03 547 9769.